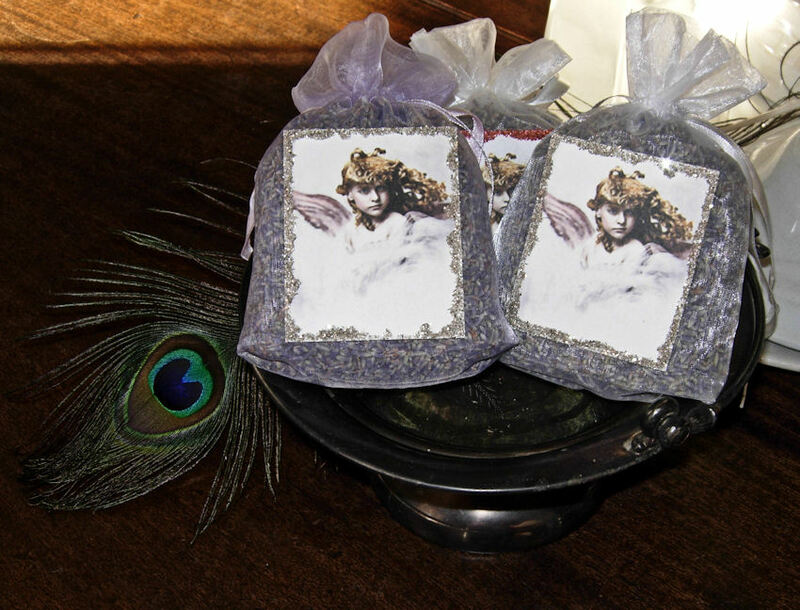 This weeks project are these lovely Angel Sachets with Lavender. 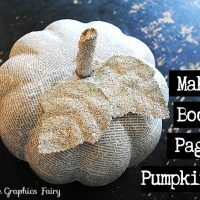 So pretty for the Holidays & Super Simple to make! This is the gorgeous antique Angel graphic that I used. You can click here for the PDF that includes 9 of them all on one sheet. 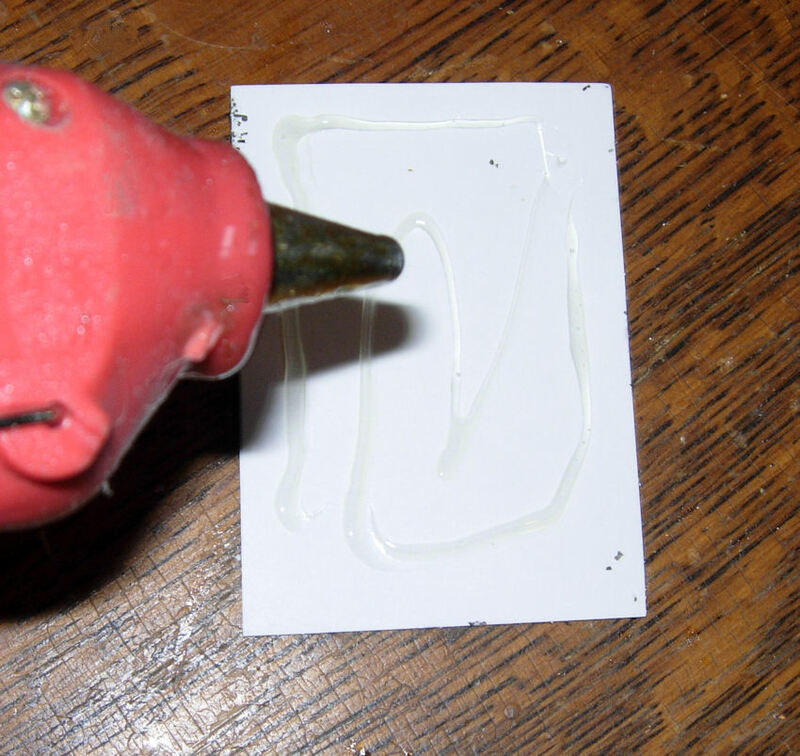 1) Glitter – I used German Glass glitter, because I can never get enough of that stuff! 5)Dried Lavender – I get mine from Atlantic Spice Co. 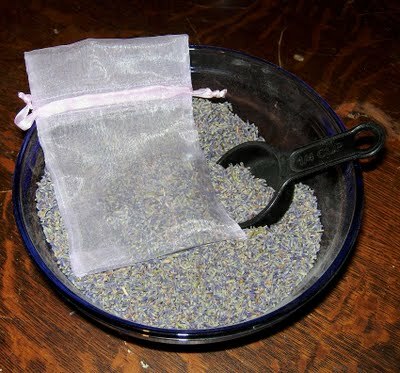 Step 1) Fill your organdy bag with the Lavender buds. I make mine quite full, so stuff it in there! 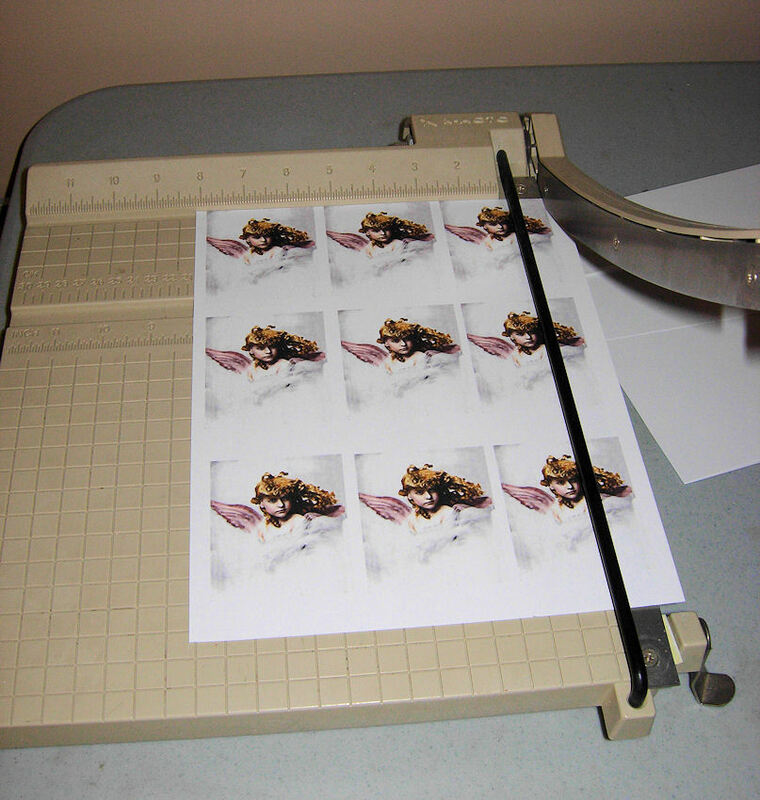 2)Print up your PDF and then cut out your images. 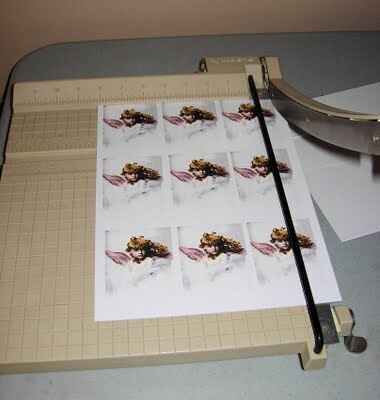 I like to use a paper cutter, it’s just easier, but scissors are fine too. 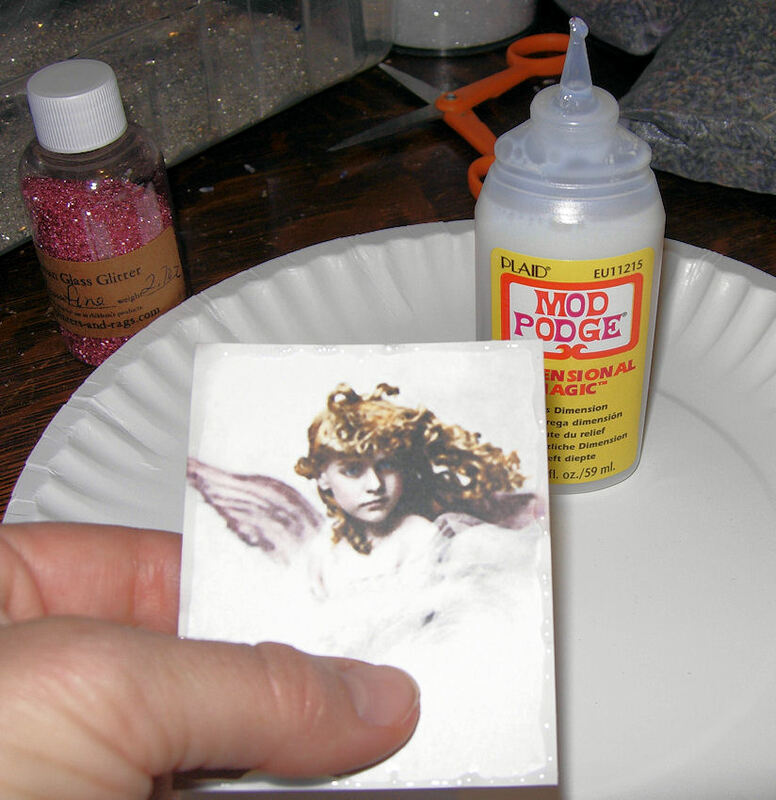 3)Use the Mod Podge dimensional glue to edge your card. You could add more to outline the wings, in her hair, etc. wherever you want some sparkle. 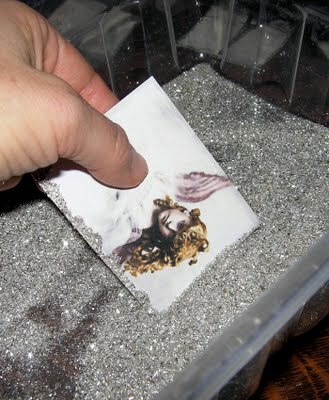 4)Add glitter to where you applied the glue. I like to dip mine into a big vat of glitter, but you could sprinkle it on too. I used silver and pink glitter. The pink actually matches a lot better than it looks in the photo below! 6)Apply hot glue to the back of your cards and stick to your filled bags. That’s all there is to it, see…I told you it was easy!!! I’ve been selling these in my shop for a number of years and they always fly off the shelves, and they cost so little to make. These would be great to make and sell at craft fairs, church bazaars etc. They make such sweet gifts too. You could personalize them, with a little note like “Teachers are Angels” etc. I hope you enjoy this weeks project! These would make such wonderful little gifts. I love them. Thank you for the tutorial. This is a great project. Thank you so much for sharing this with us and sharing your image! oh, beautiful! more gift ideas!!! Such pretty packaging for a lovely smelling sachet, Karen! What a sweet simple project. The angel is a fave graphic. Thank you for sharing. Thank you for posting such a wonderful gift idea using one of my favorite flowers, Lavender. I have five lavender plants in the front of the house, guess I’ll be harvesting. I love lavender! These would make such wonderful “happies” for friends, especially with your beautiful angel label! Thanks for the instructions and help! Beautiful! I just love lavender! Great project! 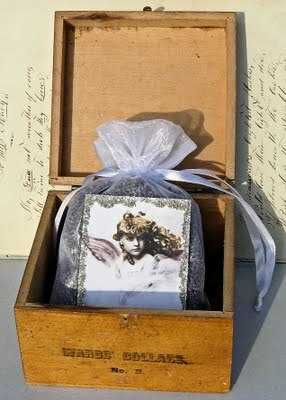 Very sweet idea and the angel graphic is gorgeous! Lavender…the ultimate relaxation fragrance! 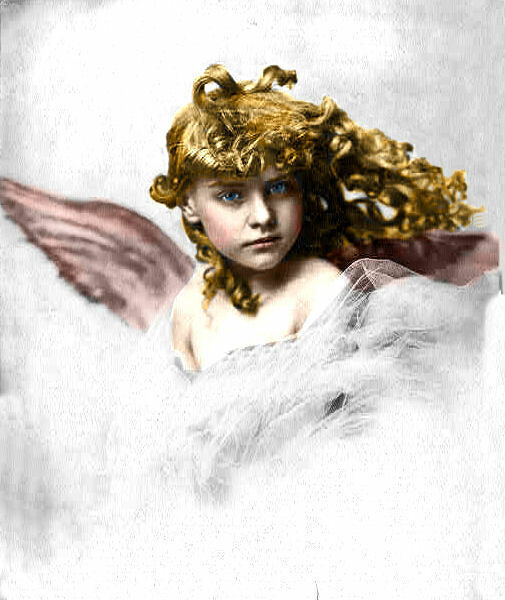 The angel graphic is lovely as well–her expression is more “intense” than many other angels, and that makes her special. Karen, you are a dynamo! What lovely little gifts! How nice for you to share the ideaausto. This is such a wonderful project, all I need now is a heat gun 🙂 Thank you so much, Petra. So lovely and a perfect idea for my “lavender” trim that just won’t sell. I could trim the bags. You are so generous with all. This makes the idea list. These are just beautiful! How kind of you to share this! Oh my these are stunning ! Come on over and link up with my Ornaments Blog Party today ! love this, so glad to have read this post! So sweet, you have a lovely taste! 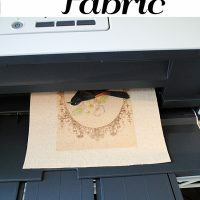 Thanks for sharing this awesome project, I will try it, as a favor for my 50th birthday Girls night out. What a beautiful gift idea! Your images make simple things over the top. Just love it! Hi Karen. 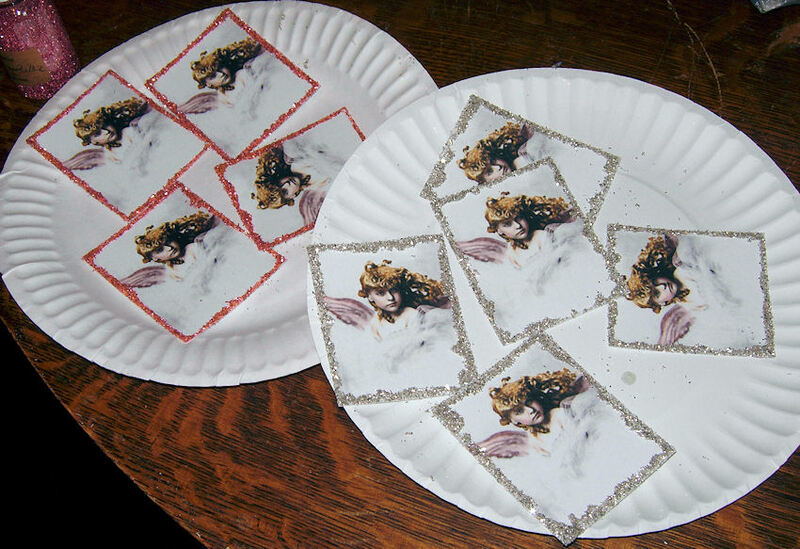 You’re sachets look beautiful. I just bought a lb. of lavender myself and plan on making sachets. I love the smell. You’re vintage labels are so sweet. Hello Karen~ I enjoy making sachets too. 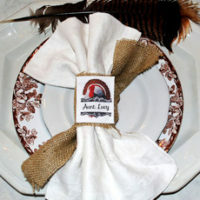 Your added touches with the glittered angel tag was the perfect finishing touch. I’ve also made them with rose or lilac petals. I put them in my customers packages for an added sweet surprise. Thanks for sharing all your wonderful ideas and clip art. Stop by sometime your company would be nice. gorgeous image – thank you for it and for the great project idea! About how much dried lavender does it take to fill each sachet? Just trying to figure out how much to order. Thanks!